Below are 29 ghostly locations in Santa Barbara County. From Santa Maria in the north of the county to Summerland south of Santa Barbara to the Channel Islands off the coastline, the county is filled with apparitions, spooks, and haunts! Pea Soup Andersons - spiritual activity happens at Pea Soup Andersons in Buelton. Flashing lights, opening and closing doors, strange sounds and phantom music are just some of the phenomenon that has been reported. In addition to mascots Hap-pea and Pea-wee, and endless bowls of peasoup, Pea Soup Anderson's in Buellton is rumored to have its gift shop haunted. San Miguel Island - located in the Channel Islands, this island is haunted by the ghost of a conquistador who also cursed all those who set up permanent residence on the island. Not surprisingly no one currently lives there. A few priceless treasures are also said to be buried either on the island or in the waters around the island, including the jeweled sword of the conquistador said to be buried with him in an unmarked gravesite. Santa Cruz Island - another island amongst the Channel Islands, Santa Cruz Island is haunted by a nineteenth century Chinese abalone gatherer who was as the legend goes, was forced to amputate his own hand or drown in the rising tide. Weak from his self-inflicted injury, he sadly still perished and his ghost now looks for his missing appendage. Additionally, on a pier, one female Native American ghost often leaves wet ghostly footprints, haunting the area where she was executed supposedly for not accepting Christianity. Santa Rosa Island - the ghost of a woman who took her own life out of loneliness now haunts this Channel Island. She appears as either a glowing ball of light or a crying woman in a wispy dress. Gaviota Beach - the ghosts of two young girls wearing white nightgowns haunt this camp ground. Their crying can occasionally be heard in the darkness. Gaviota Pass - the ghosts of defeated Native Americans are said to haunt the pass having lost a battle to Spanish soldiers who laid a trap for them. Specifically the ghost of the defeated Native American's chief has been seen wandering alone through the pass. Las Cruces Adobe - this very old adobe in Gaviota is haunted by three prostitutes, one gunfighter and many many Native Americans. Far Western Tavern - in Guadalupe, the former Far Western Tavern is haunted by the ghost of a one legged man who died in a fire. 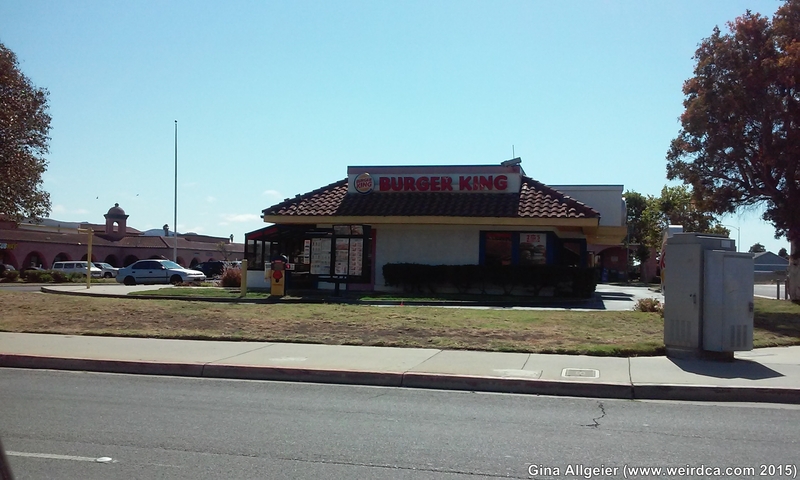 Burger King - in Lompoc, the ghost of a boy who hung himself in the ladies restroom haunts this fast food place. Cabrillo High School Theater - in the Vandenberg Village area of Lompoc, the Cabrillo High School has a ghost lurking in its theater. Her voice occasionally emanates from behind locked doors, she has been seen in the spotlight room, and students have suddenly found themselves mysteriously locked in the dressing rooms. It is rumored that she fell off the indoor balcony and died. Lompoc Furniture - rumored to have formerly been the town morgue, the second floor landing has had the ghost of a woman spotted lurking upon it. People have also felt cold spots. Mission La Purisma - in Lompoc Mission La Purisma is haunted by ghost priests, ghost bandits, and even a ghost gardner. All sorts of ghostly sounds, music, voices, and chanting has been heard as well. Tahitian Village Apartments - in Lompoc, these apartments were reportedly built on a Native American gravesite. As a result tenants have experienced all sorts of strange occurrences, phantom voices, ghostly guitar noise, and the occasional sightings of spirits. Mattei's Tavern - this very old tavern in Los Olivos is haunted by the original builder, Felix Mattei, whose picture still hangs over the fireplace in the bar area. A woman in a white gown also haunts the place after she died around 1900 by poisoning herself. Additionally, a whole host of other spiritual activity is said to occur within the restaurant. Painted Cave - ghostly voices and strange flute music have been heard in this cave covered with pictographs. Las Tres Hermanas - three ghostly nuns, murdered long ago, haunt Ortega Road in Montecito. Casa de la Guerra - formerly the residence of the fifth commandant of the Presidio de Santa Barbara, Jose de la Guerra y Noriega back from 1828 until his death in 1858. It is now haunted by a mysterious woman in black who often appears distressed and upset by those who have witnessed her. Santa Barbara Community College - the grassy area closest to the ocean of Santa Barbara Community College is haunted by a lady in white. She often appears about an hour give or take after sunset. She has a white flowy dress and a white shawl. Stories vary with her either often disappearing in a blue misty light or running towards the edge of the bluff and jumping off towards Shoreline Drive. Her origins remain a mystery and the stories have varied from a Native American killed by Spanish soldiers to a woman who died while giving birth and now searches for the comfort of her husband. College students have also described her as a possible suicide running over the grassy area and diving off the bluff. Santa Barbara Mission and Jail - the Santa Barbara Mission has the ghosts of both monks and nuns. The nearby jail is haunted by the ghost of a murdered woman who manifests as a cold mist. La Cumbre Middle School - like many schools, the theater is haunted. In this case by the ghost of Edwin, a student who died in the theater when a counterweight sand bag from from the above catwalk and broke his neck. He has been seen around the theater, especially in the upper catwalk. According to the legend, the sandbag still exists, it's just no longer used anymore. Santa Maria Bridge - High School students in Santa Maria tell that vampires live under the Santa Maria Bridge, the bridge just north of town on Highway 101. While it's true that bats do occasionally nest under the bridge, it's probable that this story originates from some local kids seeing a local homeless man living under the bridge while at the same time seeing bats. Santa Maria High School - the ghost of a former high school actress haunts the Ethel Pope Auditorium because the show still must go on. 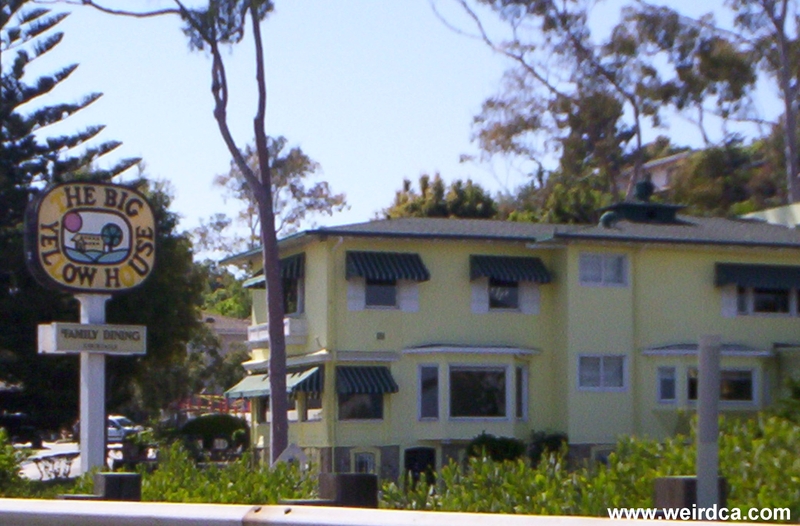 Santa Maria Inn - several ghosts haunt the Santa Maria Inn including reportedly Rudolph Valentino and the ghost of a sea captain. The White Lady of Santa Maria - at the corner of Blosser and Foster in Santa Maria as well as in nearby Pioneer Park, the ghost of a white lady has been seen. Clark Street Underpass - a local urban legend details another Lady in White haunting the underpass on Clark Street in Orcutt area (under Highway 135). Like most urban legends, she is dressed all in white, and is said to be walking along the side of the road pushing an old fashioned baby carriage. She even occasionally pushes the carriage into oncoming traffic! Black Stagecoach of Santa Ynez - a ghostly black coach has been seen traveling the road between Santa Ynez and Solvang. Mission Santa Ines - located near Santa Ynez, this Mission long ago when it was not in use, is rumored to have been home to a vile vampire. If you slept in the chapel with your shoes off, the vampire would come and feed on your toes while you were asleep. The Big Yellow House - located in Summerland (a town founded by Spiritualists), this former restaurant is haunted by multiple spirits, especially down in the former wine cellar. Vandenberg Air Force Base - the ghost of a man who perhaps died in a fire has been seen around the Space Launch Complex 5 (SLC 5). He approaches security and asks about a fire then disappearing. The fire perhaps was one from the seventies. Additionally it is rumored that a boathouse on the base is also haunted.